With PPCmate it is possible for your ads to be displayed on YouTube. Follow steps below to correctly set up your campaign. YouTube traffic is available for Native and Display campaign types. Once you go through basic campaign settings, you need to move to advanced settings. In advanced settings search for search for Sources and domains whitelist / blacklist / bidlist. 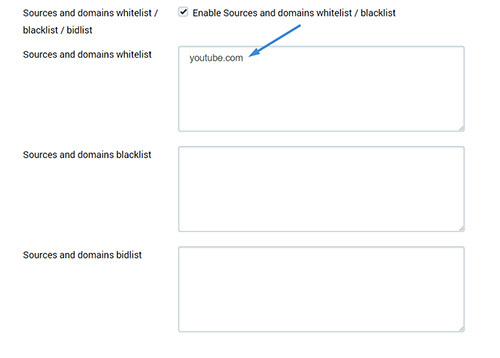 Enter YouTube.com domain in whitelist box to receive traffic ONLY from YouTube. It is best option as there are various SSPs sending YouTube traffic.